The hotel's superb location connects you to many of Bangkok attractions. For those who wish to visit the cultural Grand Palace and Wat Arun, the Chao Phraya River boat ride in the Saphan Taksin station provides an excellent alternative transport. Located in the heart of Southeast Asia, Bangkok is a modern and lively city with a variety of attractions to offer. The bustling city is filled with magnificent palaces, diverse cuisine from world-class restaurants to street stalls and shopping malls. 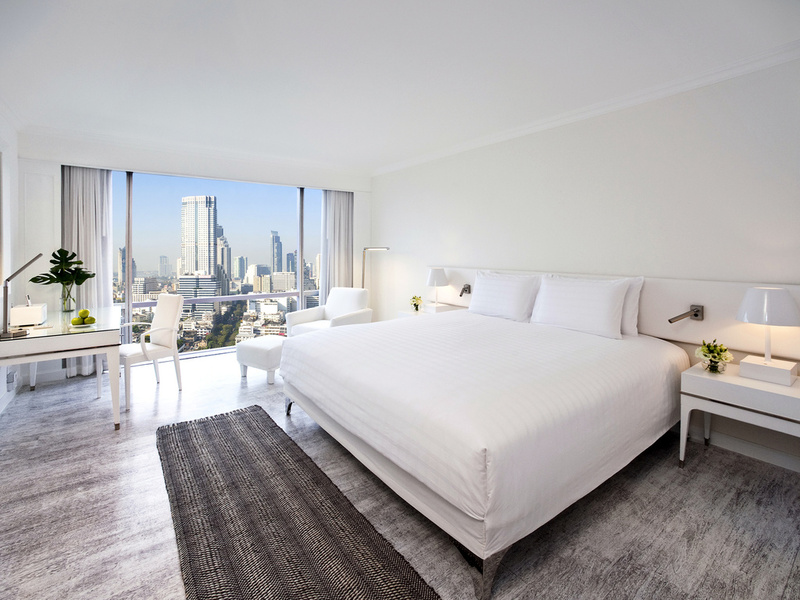 With contemporary cutting-edge design, each of the 469 spacious hotel rooms and suites features floor-to-ceiling window and natural daylight. The bar boasts a large selection of Champagnes and cocktails made to order by professtional mixologists. The trendy venue has a selection of retro board games such as Backgammon, Chess, Fussball and more. Sara and other staff at the executive longue was fantastic! Nice hotel with convenient store around. Nearby BTS too. No better way to stay in Bangkok! I have stayed here a few times now , the rooms are spacious and clean, staff are friendly and welcoming. The entrance made me a bit sceptic but later I find it ok. The room was good and bed was comfortable The restaurant on the top were great. Allover everything were good. Overall, it was okay. Service was great, the lobby looks very modern. Front-liner people are very friendly and helpful. There was an electricity shut-down when i was there. But the hotel accommodated us playground room for our small meeting and even give us mineral water. The deluxe room has enough space and very clean. However i had difficulties working at night in the room, since the lighting was not good. The decoration also made the room darker and kinda old-stylish. We use a meeting room at 36th floor for our ASEAN meeting. The facilities are great and meet our expectation. We had additional 5 participants in the last minutes but the hotel is able to accommodate this. Really appreciated the fast response and action. My favorite would be the coffee break area. It was well decorated. As usual a very warm welcome in the Lounge gave me that coming home feeling. Perfect and comfort rooms. If you can provide some sea food choice in the breakfast it would be nice. Very warm welcome with an upgrade to the Executive Lounge. It was a bit of a bummer to see that the room wasn’t upgraded as well though. The facilities are nice — apart from the rather small pool — especially the rooftop restaurant and bar! Beautiful sunset views from there! Breakfast in the executive lounge was great and our stay overall very comfortable! The staff was helpful and friendly at all times and the facility clean! Can recommend to people who like a fresh touch to hospitality and want to stay in central Bangkok! Friendly staff, comfortable facilities and great location. I was the lucky guest who also received an upgrade (which also included a late check out). The room was an excellent size with floor to ceiling windows offering great views. The king size bed was very comfortable and the bathroom was a good size with an excellent shower. I ate in the burger restaurant on the ground floor which served great food, and the extensive buffet breakfast offered something for everyone including omelettes cooked to order. I was kindly given an upgrade to the club floor. This made my stay and my business meetings wonderful and successful. Thank you to the team at P G! Hotel was very nice and great location.